Dornoch Castle Hotel stands in the very heart of the town of Dornoch, where it looks across the main street to Dornoch Cathedral. There is something special about staying in a Scottish castle, and Dornoch Castle is most certainly the real deal. Its ancient origins and castle character are obvious, yet it has been converted into a highly successful hotel in a way that provides all the facilities the modern traveller desires, including an impressive degree of accessibility. 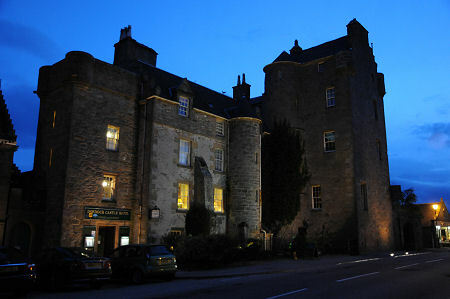 You can read our dining review for Dornoch Castle Hotel here. Dornoch Castle developed on the site of the palace used by the Bishops of Caithness from the 1200s. Much of the main tower or keep may date back to the 1400s, while the slightly lower eastern wing was probably built in the early 1500s. In 1570 the castle was besieged and the town of Dornoch badly damaged by MacKays during a clan feud. The castle went on to serve as a home for the Earls of Sutherland until 1715. By 1760 Dornoch Castle was derelict, though it was restored to serve as a courtroom and jail in the early 1800s. It passed into private hands in 1922 and was extensively modernised. Conversion to a hotel followed in 1947, and the current owners have significantly improved and upgraded the accommodation and facilities since taking over in 2000. Most of the hotel's public rooms are on the ground floor. The first you will encounter is the superb bar and reception area which oozes castle character and whose focal point is the large fireplace occupying much of one wall. The massive scale of the bare stone walls reflect the bulk of this wing of the castle. The well stocked bar curves around at the far end of this room and an arched doorway leads through to the Garden Restaurant. This is a large conservatory extension projecting into the garden and running along one side of the relatively modern garden wing at the rear of the castle. Upstairs in the main castle is a comfortable guest lounge, complete with another open fire. Plans are in hand for a second rear wing, down the other side of the large garden, which will house a bistro and spa: watch this space. There are 24 guest rooms at Dornoch Castle Hotel. 11 can be found in the original castle, comprising two deluxe rooms, the superb Old Courtroom and Cathedral View, and 9 superior rooms. There are also 10 rooms in the garden extension to the rear of the hotel, graded as superior rooms or garden rooms. They include one single and a family suite, and two accessible rooms. The remaining three rooms are in a chalet in the garden and tend to be let when the rest of the hotel is full. They are due to be replaced when the planned new wing is built, which will add a further 12 bedrooms to those currently available. Equipment levels in the guest rooms are extremely good, and the beds are very comfortable. Several rooms come complete with four poster beds. Dornoch Castle Hotel is a popular venue for wedding receptions, in large measure because it is only a short walk from Dornoch Cathedral. Weddings may also be held in the castle itself and up to 90 guests may be accommodated internally or 150 with a marquee. Another important draw to the hotel is Dornoch's nearby championship golf course, consistently rated as one of the best in the world, and easily the most northerly championship golf course in the world. Corporate events may be arranged accommodating up to 70 in the Garden Restaurant or 20 in the lounge. For such an old building, disabled access is good. There is level access to the ground floor bar and restaurant, and a toilet is provided. Two specially adapted rooms, with convenient parking, are available on the ground floor of the garden wing. We were looking forward to our visit to Dornoch Castle, and came away with our high expectation surpassed. We first stayed at the hotel in 1992 when the internal layout was very different and the public rooms much smaller, and it was fascinating to see the way an old building could be sympathetically changed to bring it up to date while preserving its essential character. The quality of service from a young and enthusiastic team is outstanding and we found every aspect of our stay to be superb. You can read our dining review for Dornoch Castle Hotel here. Open all year except 24/25/26 December.